Thinking and writing about teaching, parenting and life. I missed every day of school last week. The flu did not care that we were in the middle of Romeo and Juliet or that I really needed just *one* more assignment to feel extra confident while writing report cards. I sent in approximately a million movie clips to show. I lay on my couch, feverish, while Benvolio and Mercutio teased Romeo about the girl he loved yesterday. As I flicked aimlessly through Netflix, Romeo wandered through the Capulets’ gardens, then climbed up to Juliet’s balcony. I didn’t get to see the students’ shock when they first saw Olivia Hussey as Juliet (“But she’s so young!”) or hear the intake of breath when they realized that guns and “Verona Beach” have replaced swords and Verona in Baz Luhrman’s movie. I didn’t get to watch their eyes widen at a passionate Black Romeo from BBC or narrow at an almost-empty stage in the RSC’s version. I missed a lot, but I was really sick. I did get some perspective. I realized that my number one goal for R&J with this class is that they don’t hate it. Or at least that they don’t hate it because they find it inaccessible. So I was nervous when I went back to class today. What did they think of last week? Did my movie clip gambit work? Did they understand? Did they hate it? Well… one girl greeted me with a disappointed, “Oh. It was so nice last week when you weren’t here and we didn’t do anything.” But she grinned a little as she said it, and her friend elbowed her under the table. I know they did work; I have the class notes. And then, as we talked, two students revealed that they had watched THE ENTIRE MOVIE over the long weekend. Well, hello there. (One chose Zefferelli, one chose the 2013 version – don’t judge.) When I said that since they clearly knew what was going on, we needed Mercutio to die by Friday, there was laughter and a ripple of anticipation. Of course, the two students who hated it before haven’t shifted their position at all, street brawls and dead bodies or no, but they are tolerating things. A few have a field trip tomorrow. As they were leaving, one said, “Just fill me in on what happens, ok?” Yeah, I think I can do that. R&J for the win. If all goes well, everyone will be dead by late next week and we can move on. The space shuttle exploded sometime between the end of Algebra 1 and the beginning of English. We were at lunch, eating sandwiches and flirting madly as the shuttle burned. I found out in the hallway on the way to class. “Did you hear?” “Have you heard?” The news was almost gossip. When our English teacher – Mrs. Barkman, impossibly old – let us in, her eyes were red-rimmed and glistening. “I imagine you’ve all heard,” she snapped. We watched the fiery footage, then she promptly told us to spend the period writing about the disaster. If memory serves, Mrs. Barkman just sat at the front of the class, stunned. I was 14. During what remained of our 53 minutes, I wrote a well-reasoned piece about how the astronauts knew the risks they were taking and how sometimes progress requires setbacks. I explained that while it was sad, it wasn’t really *that* sad because, you know, space travel is dangerous. I wasn’t unmoved, exactly; I was more caught off-guard. The disaster felt unreal and distant. The space shuttle was so much bigger than me that I couldn’t really see it. Today, as Notre Dame de Paris burned, I could see all too clearly. I remembered my moments there: climbing the bell towers with students; savoring ice cream nearby with friends; exploring the interior with family; kissing lovers in the shadows of the buttresses; sitting in quiet awe of the hushed silence that kept the space holy even as tourists paraded through. Today, I felt the history in the stones as they tumbled, knew the destruction of the stories, understood the devastation of a people. Today, the fire at Notre Dame rose in me until my tears flowed for what we have lost, for what we can lose, for what we will, inevitably, lose. Today, 33 years after Mrs Barkman wept, I mourn with her. Together, across the years, we weep for the unflagging courage of our dreams and for the devastation of their loss. Elisabeth recommended it, and Catherine had a copy. I committed to exploring graphic novels this year, so I read it. 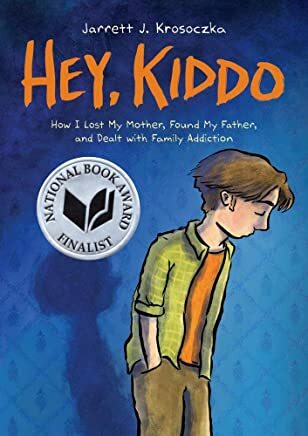 I liked Hey, Kiddo a lot – well enough to recommend it – but it didn’t knock my socks off. Still, I decided to book talk it in my class because many of my readers are either artists or are reading lots of graphic novels right now: It seemed like a good fit. Some books get immediate love in my class – two or three sets of hands reach for them as I finish talking, and the kids have to work out who gets to read first; others languish – I set them near their intended target, but the book stays firmly closed; this book snuck away from me – a student picked it up when I wasn’t looking, and I had to glance around the room to see where it was. I wish I could say that I was thinking of this student specifically when I gave the book talk, but truthfully, I had a few kids in mind. Only after I saw J caress the cover as he slipped the book into his backpack did it occur to me that this book might be the right book. He savoured it over the next few days, lingering over some of the images, writing about it during a free write, rereading certain sections. The book was clearly speaking to him. At the end of the week, I swapped out my friend’s copy for a copy I’d picked up from the public library. After all, I needed to return the book to my friend. J was fine with this so long as he could keep reading. I gave J the book today. Busses had been cancelled because of freezing rain so only three students made it to class. J was astonished when I told him it was his, “Really? For me?” He held the book tightly for a moment before slipping it carefully into his backpack. And then, he told us his story. Just us, in a small circle in our little room in the library, drinking tea and sharing truths because of a book that made someone feel a little less alone in the world. One magic book. She shook her head and her eyes glistened. She muttered, “When you keep telling me to stop, it makes me not want to work.” Then she closed her laptop, put it away, grabbed her things and walked out. She was texting her friend, who was now on her phone full time, texting her back. I let this continue for a few minutes, sensing that she might need support, then quietly but firmly told her friend to say goodbye and put her phone away. I chatted briefly with her friend because she had also played a role in the incident. When she returned – right before the end of class – she didn’t want to speak with me. She had only come for her friend. I tried to talk, then acknowledged that she was still upset and suggested we try again later. I said, “think about what you’re asking for. We need to talk about this because it’s not just going to go away.” She retorted, “I’m not a robot.” I honestly did not know what she was talking about. She’s an excellent student in my class. She loves to read and writes with some ease. She comes every day, participates in discussion and generally seems engaged. Over the last week or so, she’s been a bit less forthcoming, but I did not expect today’s events. By the end of lunch, I had settled down and started to gather information. First, I checked in with our EA. She, too, had noticed a change in behaviour and she didn’t think it was getting better. Then, I emailed her other teachers to see if they had any concerns. Two of the three emailed back immediately: yes, they were worried. She had been skipping classes and not handing in work. Uh-oh. Finally, I called her Period 3 teacher and asked if she could invite her to come talk to me at the end of classes. She did, but she was still so upset that she nearly cried and she couldn’t articulate her problems. I offered to write her a note to get into her next class, but she said her teacher wouldn’t care. Then she skipped the class. I hesitated about calling home. At this point I was worried about her, but I did not want to get her into trouble; I wanted to find out what was wrong and to alert her parents that something had changed. In my office after school, I talked it over with another teacher. The final decision came down to this, as it so often does: “If your child was behaving this way, would you want to know?” Absolutely. I called her mother. I opened the conversation by talking about how much I enjoyed having her in my class. I told her mother that her grades were good and she was generally an excellent student. Then I said that I was worried, that her behaviour had changed recently and that today had seemed really unlike her. I said directly that I was not calling to get her in trouble but rather to make sure that everything was ok. I don’t think it is. Her mother did not know about any of the skipping and was immediately worried about her courses. Mom said things seemed fine over the weekend but wondered aloud about some other issues. We made a plan that involved mom talking to her tonight over ice cream and mom-time and me trying again tomorrow. Now, I’m replaying the class in my mind and wondering what role I played in this moment. What has changed over the past two weeks? We’ve finished our preparation for the big standardized test and the students wrote the test on Wednesday. Could that have been more stressful for her than I realized? Maybe, but it doesn’t feel quite right. Hmm… No one has changed seats – and while I don’t love the seat she and her friend have chosen, it has remained consistent all semester – so I doubt that’s it. What else? I have tried, with depressingly little result, to implement a “no cell phone” policy. I’m not especially good at taking the phones away, unfortunately, because I am reluctant to introduce extra conflict into the classroom. I’m usually grateful that the worst offenders show up, so sending them out seems like a bad idea. Still… I wonder if the cell phone thing isn’t playing a role. There are two kids in the class who have pronounced struggles with behaviour. I’ve been really at a loss about how to get them off of their phones. In fact, one of them left class last week when I asked him to put his phone away. (That’s a whole different story. I was actually pleased by his good decision making in that moment – though I still wish the phone wasn’t a problem.) I’m wondering how she views my behaviour. I’m pretty sure she sees herself as a good student who just wants to chat a little with a friend I wonder if my student believes I am treating her unfairly? And now that I’m thinking about that, I realize that I have curtailed the amount of pair and group time for the class because I’m worried about behaviour issues and about the way the class is interacting. The last few class periods have been largely teacher-centered. Harumph. That’s not good. Why am I taking over? It’s a tiny class, but despite my efforts, I am virtually certain that at least some of the students would not define it as a safe space. And there’s the crux of the problem: I suspect it’s safer for a student to leave, knowing we will talk when they have settled, than to stay when things aren’t going the right way and others might judge them. When I asked the girls to be “part of the class” they reacted badly because I had put my finger on the pulse of it: our class isn’t a cohesive group right now. It needs to become whole again. This isn’t the entirety of the problem, of course, but it does give me a starting place. I would like our little class to serve as a safe space when other classes are tough, not to be the tough place. She’s good at English. This should be where she shines. So we need to figure out a way to make our class safe again. Might as well start tomorrow. A journey of writing... my teaching life, my family life, and my journey through life. This is where I write. Just a teacher, who happens to be a mom, who happens to love to write.